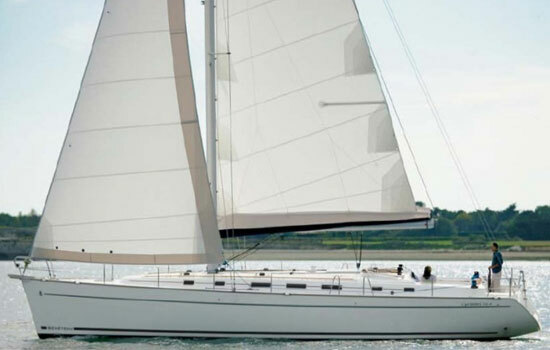 The Beneteau Cyclades 50.4 is compared to other 50 footers, a big boat. The 16-foot beam translates to a terrific amount of space about twice the volume of more traditional 50-footers. This space leads to a level of comfort unsurpassed in its class. Five cabins make up the accommodations, with four double cabins, each with its own head and shower in the corners, and a single berth and head for crew/storage/workshop way forward, accessed though a foredeck hatch. Interior is fully air conditioned and standard is a diesel generator which adds to the comfort of this blue water cruiser The comfortable cockpit has easy access from the built-in swim platform due to the twin steering wheels. These twin helms also allow full forward views under sail. All lines lead aft for ease of handling. Full batten mainsail, Roller genoa, Lazy Jacks with Lazy Bag. Dinghy with Outboard Engine, Radio, CD Player, Bimini top, Sprayhood, Cockpit Speakers, Cockpit Table, Linen, Towels, Snorkeling gear.. * For full specs, please Click Here.